Greetings, from the Crenshaw Church of Christ, where Christ is glorified! 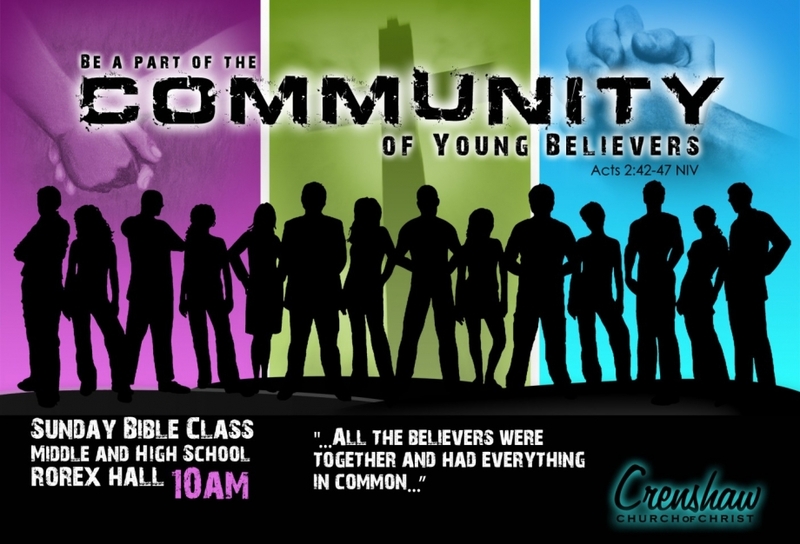 We welcome you to our Youth Page and hope you are encouraged, uplifted, and edified by our service. Our mission is to prepare our young people for the work of the Lord, by winning them to Christ, building and grounding them in the Word, and equipping them for His work. Our aim is offer our youth an alternative to the trappings of this this work that leads to sin and destruction by providing spiritually based activities, such as Bible Study, Worship in the Park (mass worship service at a community park), attending the California State Youth Conference, Friday Night Live, Worship on the Mount (mass worship service at Magic Mountain), feeding the homeless, to name a few. Our Youth Ministry is every evolving. We have around 60 youth between the ages of 11 and 18. Our young people can be found participating in various works in our congregation and the community. Take a moment to tour our page and get a glimpse of us in action.